This story was updated at 5:40 p.m. EDT. CAPE CANAVERAL, Fla. — NASA unveiled the final flight plans for its three retiring space shuttles on Tuesday, assigning two to museums in Washington, DC and California, and keeping the third at its launch and landing site in Florida. A fourth, prototype orbiter will also go to a new home in New York. NASA Administrator Charles Bolden announced the long-awaited news during an employee event held at Kennedy commemorating the 30th anniversary of the space shuttle program. STS-1, the maiden flight for the winged reusable spaceship fleet, lifted off on April 12, 1981. "Each shuttle has stories to be told, history to be shared," Bolden said. "We intend to tell their stories and share that history with as many people as we can over the coming years and decades." "People from across our nation and around the world will continue to learn from these amazing vehicles and the stories of their crews and their missions. The shuttles will inspire many people who are now just in school to become the next generation of exploration leaders and millions more who are just proud and passionate about our space program will also now have a chance to see a space shuttle in-person," Bolden said. Space shuttle Discovery, NASA's oldest remaining orbiter and the world's most flown spacecraft, will be displayed by the Smithsonian's National Air and Space Museum at its Steven F. Udvar-Hazy Center near Dulles International Airport. The shuttle Endeavour, which will launch on its own final mission later this month, will be given to the California Science Center, a department of the State of California, in Los Angeles. "The California Science Center in Los Angeles [is] only a few miles from the site of the old Rockwell plant where the shuttle was developed and from where its construction was managed," Bolden said. Shuttle Atlantis will remain in Florida to be exhibited at the spaceport's official visitor complex after launching on the 135th and last mission of NASA's shuttle program in late June. "The Kennedy Space Center, where every shuttle mission and so many other historic space flights have originated, will showcase my old friend Atlantis," stated Bolden, who as an astronaut flew one of his four missions on Atlantis. "Not only will the workers who sent it into space so many times have a chance to still see it, the millions of visitors who come here every year to learn more about space and be a part of the excitement of exploration will be able to see what is still a great rarity, an actual flown space vehicle." Bolden also announced that the atmospheric test orbiter Enterprise, which has belonged to the Smithsonian since 1982 and has been on display at the Udvar-Hazy Center since 2003, will be transferred to the Intrepid Sea, Air and Space Museum, a converted aircraft carrier docked to a pier in New York City, to make way for Discovery to enter the national collection. At present, NASA plans to have the shuttles ready to ship to their museums by early- to mid-next year. At the National Air and Space Museum's Udvar-Hazy just outside Washington, D.C., Discovery will be rolled into the James S. McDonnell Space Hangar, where it will serve as the centerpiece for an exhibit hall already filled with other historic space artifacts. As Discovery moves in, Enterprise will be shipped up the coast to the Intrepid in New York. Too large to fit on the deck of the aircraft carrier and still have room for the other aircraft already on display, Enterprise will be housed in a planned glass-enclosed hangar that will sit alongside the Intrepid on Pier 86, where the museum's Concorde jet sits now. According to an artist's concept drawings, Enterprise will be displayed with its payload bay open, surrounded by interactive educational exhibits. Endeavour will be sent west, joining the space exhibits at the California Science Center, where Mercury, Gemini and Apollo spacecraft are already on display. Unlike the other museums selected, the science center did not pre-release its exhibit design concepts for the orbiter. At the Kennedy Space Center Visitor Complex in Florida, Atlantis will be suspended such that it appears to be back in orbit around the Earth. As proposed, a multi-story digital projection of the home planet will rotate behind the orbiter in a new $100 million, 64,000 square-foot indoor facility. Kennedy's display is designed to complement its existing Shuttle Launch Experience, which opened in 2007 to give visitors the chance to feel what it was like to ride to space aboard one of the orbiters. "I want to congratulate all of these fine institutions and wish them many visitors and exciting programs with the space shuttle fleet. For all of them, take good care of our vehicles. They've served the nation well, and we at NASA have a deep and abiding relationship and love affair with them that is hard to put into words," Bolden said. Bolden's announcement Tuesday came three years after NASA first said it would give its retired space shuttles to U.S. museums or educational institutions. Solicitations in 2008 and then again last year identified 21 organizations vying for an orbiter. Museums needed to provide an environmentally-controlled indoor exhibit space and be able to afford the estimated $28.8 million needed to prepare the orbiter and transport it for display (Congress waived the fee for the Smithsonian). "There were many, many worthy institutions that requested an orbiter and only four to go around," Bolden said. 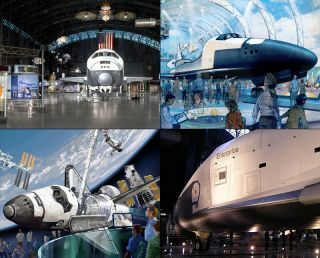 Continue reading at collectSPACE.com to learn more about NASA’s space shuttle display selection process.